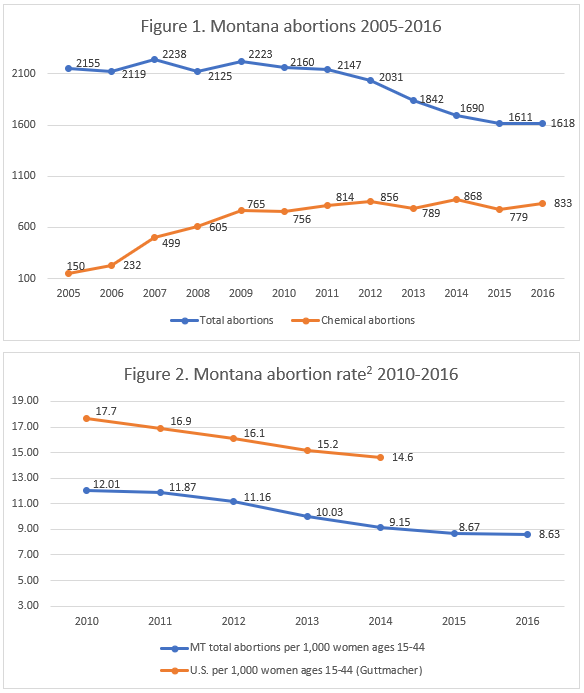 Montana’s 2016 abortion report, published online in September 2018 as part of the state vital statistics report, shows that abortions in the state continue to be performed at later gestational ages. The number of abortions reported in Montana was basically unchanged from the year before, but chemical abortions now make up a larger percentage of the total. *Information on Montana’s state abortion rate and Planned Parenthood’s Montana market share is not publicly available. In 2016, there were 1,618 abortions reported in Montana, a change of less than half a percent from the previous year (Fig. 1). Chemical abortions increased by a greater margin, seven percent, from 779 in 2015 to 833 in 2016. The 2016 abortion report shows that total abortions in Montana have dropped by 27 percent since 2003, the earliest year included in the report, while chemical abortions have increased by more than 750 percent. In 2016, 51 percent of the abortions reported in Montana were chemical. Montana does not report the state abortion rate, but the Charlotte Lozier Institute estimates that the rate was stable from 2015 to 2016, with 8.7 abortions per 1,000 women of childbearing age in 2015 and 8.6 abortions per 1,000 women of childbearing age in 2016 (Fig. 2). More than half of the abortions reported in Montana, 57 percent, were performed on women in their twenties. Twenty-eight percent were performed on women in their thirties and four percent on women aged 40 or older, while 10 percent were performed on girls between the ages of 15 and 19. Eighty-seven percent were performed on white women, eight percent were carried out on American Indian or Alaska Native women, and five percent were performed on women of another race. Eighty-six percent of the abortions reported in Montana were performed on Montana residents. Just over half of the abortions reported in 2016 were performed on women who had already given birth before – 22 percent had one previous live birth, and 30 percent had two or more. An even higher percentage of the women getting abortions had had an abortion before. Forty-one percent had one abortion in the past, and 21 percent had two or more. The report does not state the number of women who had both a previous birth and a previous abortion. The majority of abortions occurred early in pregnancy, with 64 percent performed at eight weeks of gestation or earlier. Twenty-six percent were performed between nine and 13 weeks of gestation, and five percent were performed early in the second trimester between 14 and 15 weeks of gestation. However, many abortions were performed later in pregnancy – three percent were performed between 16 and 17 weeks, and two percent occurred between 18 and 20 weeks of gestation. There were 11 abortions performed at 21 weeks of gestation or later. Montana no longer reports abortion complications in its vital statistics report as it used to in previous years. However, the Montana Department of Public Health and Human Services informed the Charlotte Lozier Institute that over a two-year period from 2015 to 2016, 14 abortion complications were reported in Montana1. Currently, Montana law prohibits abortion after viability unless the mother’s life or a major bodily function is at risk. In 2017, the legislature attempted to offer further protections to the unborn, passing a bill to protect unborn babies after 20 weeks post-fertilization – five months of pregnancy, when babies can feel pain – unless the mother’s life or a major bodily function is in danger. Both chambers passed the legislation, but the bill was vetoed by Governor Steve Bullock in May 2017. The legislature also tried to strengthen the viability limit. “Viability” was more precisely defined as the point when the baby has a greater than 50 percent chance of surviving outside the womb with artificial aid. The bill established that the life of a viable unborn baby must be protected when his or her mother’s life or health is in danger; in such emergency situations, viable unborn babies must be delivered via c-section or labor induction. A doctor must not use an abortion procedure that would cause the unborn baby’s death. The bill was passed by both the Montana House of Representatives and the Montana Senate. However, the legislation was vetoed by Governor Bullock. In 2016, CLI published a study ranking the 50 states, New York City, and Washington, D.C. on the quality of their abortion reporting. Montana was ranked at 23rd place. Since then, the state has taken steps to improve its reporting – the report now includes information on previous pregnancies, gestational age, and race. Still, Montana could improve its reporting further by including data points it currently collects, but does not report, such as the marital status and education of the women who get abortions. Montana could also begin collecting information on women’s reasons for abortion and the types of facilities where abortions take place, as many other states do. Additionally, Montana could speed up its reporting process and make 2017 statistics available more quickly. As the legislature works to protect unborn Montanans, citizens and researchers would benefit from a comprehensive view of abortion in the Treasure State. Montana does not report the state abortion rate. Rates were calculated by the Charlotte Lozier Institute using population estimates from the United States Census Bureau. The rates were calculated using the following formula: (total number of abortions performed in Montana ÷ number of resident women ages 15-44) x 1,000.